To honor the memory of my cousin Martin Slobin, z”l, I am reposting blog post #14 from February 24, 2015. We lost Marty on December 6, 2001. With love to Marty and my Aunt Bess, z’l and my Aunt Rose, z’’l. Cherished. I was one of those precocious little Suzuki violin kids. We were schooled strictly in classical music, that is, as soon as we could scrape through Mississippi River. 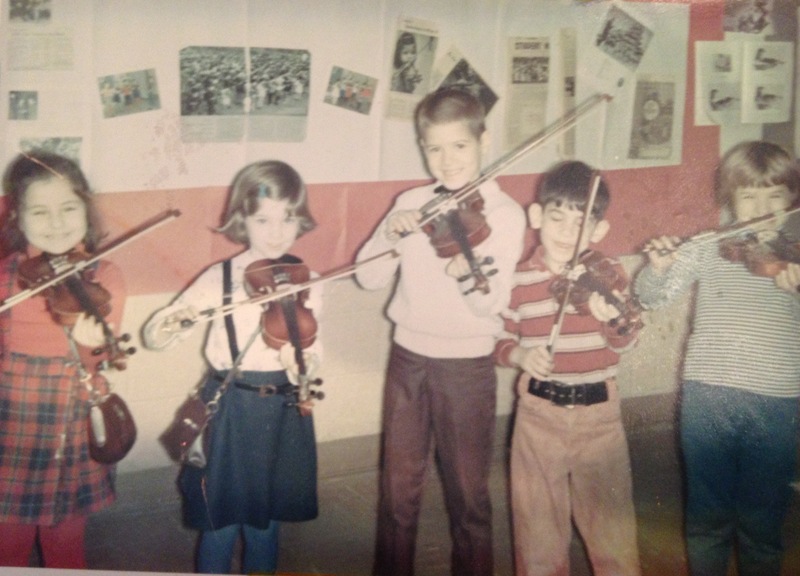 My first violin was quarter size and our early training involved marching around the room trying to keep the violins tucked under our little chins. Tiny violins bounced everywhere. But music really exploded for me on Sunday afternoons when I got to watch Bill Kennedy at the Movies on WKBD-TV channel 50 in Detroit. Bill Kennedy was the faded, slightly pompous former B movie actor who hosted the show. He had this one great scene as a tennis pro with Bette Davis in Dark Victory, which he referred to often. It was here that I watched my first musicals: Top Hat, Singin’ in the Rain, Meet me in St. Louis, The Band Wagon. This was the music, these were the songs that I really fell in love with, the ones that stuck in my head. That person was my cousin Marty. He wasn’t at all the type of person you’d expect to notice things. But he did. Marty was my mother’s first cousin. He shared an apartment with my two great Aunts. my grandmother’s sisters, Bess and Rose. My grandmother lived alone in the apartment across the way. My sisters and I would always see the Aunts and Marty at holiday dinners or be trooped unwillingly across the parking lot to visit their little apartment. It was hot in there and there wasn’t much to do except answer questions about whatever it was we were doing. The Aunts hung on our every word and beamed at us for even the smallest accomplishments. We should have feasted on this avalanche of praise and affection but we didn’t really. We felt squirmy and uncomfortable. At some point in the conversation, Marty, Bess’s grown up son, would be summoned from his room to say hello to us. Marty’s room was a great mystery. No one was ever allowed in there. Not even my Aunts. But the door was ajar once and I peeked inside. What I saw was a fantastic jumble of books and records amidst the whorl of an unmade bed. It was a mess, it was utter comfort, it was a refuge and a fortress. It reminded me a lot of my bedroom at home. Marty always entered the living room slowly and bashfully even though this was his home, he was the adult and we were just little kids. He was a heavyset man with dark curly hair. He smiled a lot. He perspired a lot too—the apartment was kept extra warm for my Aunts—so much so that his thick black glasses slid constantly down his nose. But the look of appreciation on his face, no matter if I was talking about whatever old movie I’d just seen, what music I’d played or some song I loved, was real. I was probably self-importantly talking about some play that I’d been in at camp when he got really excited and went to his room. He returned with Allan Sherman’s My Son, the Nut, which he placed gently on the turntable. Marty was the first person to play “Hello Muddah, Hello Faddah “ for me. I got it. It was cool. The albums that were stacked along side were by people like Miles Davis, Thelonious Monk, and John Coltrane. I wasn’t ready for them yet. Not by a long shot. At holiday dinners he usually didn’t say much. He would always wear a tie although he always looked like he’d rather take it off. If there were uncomfortable silences he would always talk and talk about how much he loved the spinach. On the violin I learned how to play Leroy Anderson’s Fiddle Faddle and would have gone crazy with joy if I had somehow heard about jazz violinist Joe Venuti but I didn’t. I was a high octane behind the scenes high school theatre person. I did my best to keep up in chorus class. I was hurt that I wasn’t a part of the revered Madrigals singing group at Kingswood (my sister Lisa was) but I still found that I completely and totally loved harmonic singing. I overheard that several times a year Marty would take the train to Toronto to go to Jazz clubs or Jazz festivals. I don’t know who he saw up there. Chick Corea? Charlie Mingus? I don’t remember him playing that music for us on those afternoon visits. Was he too shy? Did he feel his connection to that music too private to share? Or did he know that to truly fall in love with something you need to discover it yourself? I had heard the stories. That he had asthma and terrible allergies. That he was babied by his mother, my Aunt Bess, who coddled and overfed him. That he wasn’t allowed out to play much as a little kid and had a way of running with his flat feet slapping the pavement and his arms flapping wildly in the air. That he hated driving and took the bus, a true anomaly in car crazy Detroit. That he was smart. Really, really smart. Over the years he never once made one of those cringe worthy comments about “how much I’d grown.” But I knew he noticed when he said that I reminded him of Janis Siegel of the Manhattan Transfer. By then I liked songs like Sing, Sing, Sing, Java Jive, and Dream a Little Dream of Me. Progress. After college I lived in Brooklyn before Brooklyn was cool. I stretched meager paychecks by buying groceries at Balducci’s with my Dad’s American Express card. But one night I went to the renowned Blue Note all by myself, to hear “The Divine One”, Sarah Vaughan. In that cramped jazzy space, I sat alone at the bar drinking Bloody Marys at nighttime. It was the only drink I knew how to order. But there, on that wonderful night, I actually heard Sassy herself sing Misty. After that night I knew why Marty went to the Jazz clubs in Toronto. I was away from home for a long time. I grew up, I worked, I married, I had children. Back in Detroit, my Aunts died. Marty was left alone. He moved to his own apartment. Alone a lot in New York, I listened to music. On my own I discovered Dinah Washington, Ella Fitzgerald. Peggy Lee. The Boswell Sisters. Then Marty died as well. He was only 55. It was from his obituary that I learned that he was a revered and award winning Political Science lecturer at the University of Michigan Dearborn, known for both his bristling intellect and unfailing kindness to his students. It had never occurred to me to ask what kind of work he did. Of all the stories in Ray Bradbury’s beautiful Dandelion Wine my favorite is “The Swan”. Drawn together at a soda fountain over the unusual order of “a dish of lime-vanilla ice” young Bill Forrester meets and befriends 95-year-old Helen Loomis. Despite the extreme differences in age the two form a transcendent bond. It’s clear they were meant to be together, but according to Helen, just not in this life. Maybe the next. Or perhaps the next one after that. Ray Bradbury does not leave us with a happy ending in this story but instead with a wistful, open-ended one. Maybe this is true for lost friendships as well. But all I know is that I desperately miss someone I never really knew at all.